This article is about the stage called Gerudo Valley. For the music track, see here. Gerudo Valley as it appears in Smash. Gerudo Valley (ゲルドの谷, Gerudo Valley) is a stage in Super Smash Bros. for Nintendo 3DS and Super Smash Bros. Ultimate. It is one of two stages from the Zelda universe in Super Smash Bros. for Nintendo 3DS, alongside Spirit Train. This is where Ganondorf is fought and unlocked in Smash 3DS, and in Ultimate, Sheik is fought here when being unlocked. Battle in the Gerudo Valley stage in SSB4. The Gerudo Valley stage is a mostly flat, grounded stage. The stone and natural flooring serve as solid platforms, and a bridge crosses the chasm between the two stretches of land. Two canopies stand on each piece of land, providing soft platforms featuring the Gerudo symbol for characters to stand on. The central bridge can be destroyed by attacking it, similarly to the floor of Green Hill Zone: this allows access to the chasm below, and makes the bottom blast line move downwards to compensate. Two small platforms, which can also be broken by attacks, protrude from each side of the chasm, as well as some damaging spikes which disappear when hit and do flame damage. Soon after the bridge is broken, Koume and Kotake fly down laughing, and one of them casts a spell which alters one half of the stage: Koume's spell hits the left side of the stage covering it in damaging flames, while Kotake's spell hits the right side making freezing ice spikes appear. After a while, the "Song of Time" will be heard and the bridge will repair itself: this returns the blast line back to its default position, KO'ing any fighters who do not return to the surface quickly enough. In earlier versions of the game the blast line moved rather abruptly, KO'ing fighters almost instantly as a result: this has been changed in Version 1.0.5, and players are now given a bit more time to recover before the camera returns to the default position. 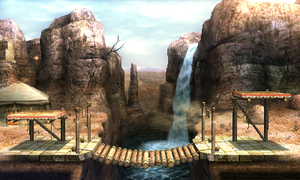 The background of the stage features a waterfall, the Carpenters' tent and, behind the mountains in the left side, Gerudo's Fortress and the Horseback Archery Range. A desert wind will blow across the stage, for aesthetic effect. In Super Smash Bros. for Nintendo 3DS, the Ω form is set on a completely flat platform that extends below the blast line that also has the Gerudo symbol as the floor pattern. In Super Smash Bros. Ultimate, the main platform of the Ω form and Battlefield form is a slightly redesigned version of SSB4's Ω form; however, it does not extend below the blast line and is resized and reshaped to match Final Destination and Battlefield, respectively. The three soft platforms of the Battlefield form resemble the flooring of the Ω form. See also: Kotake and Koume. This stage is based on Gerudo Valley from The Legend of Zelda: Ocarina of Time. It is a long, deserted valley that acts as the gateway to the domain of the Gerudo, and Link has to traverse it in order to reach Gerudo's Fortress and the Haunted Wasteland. Aesthetically, this stage is more similar to how Gerudo Valley appears in the remake, The Legend of Zelda: Ocarina of Time 3D. In Ocarina of Time, the Gerudo decided to destroy the bridge over Zora's River to prevent intruders from entering their land. Carpenters then set up a camp nearby and attempted to repair it; however, they were later captured by the Gerudo and held captive in their fortress. After Link infiltrates the fortress and rescues them all, the bridge is finally repaired. The symbol on the platforms represents the Gerudo tribe. In the original Ocarina of Time it was different, but it was replaced with the current version in all subsequent games (including ports and remakes of Ocarina) due to its resemblance to the Islamic star and crescent. The intact bridge in Gerudo Valley from Ocarina of Time. Gerudo Valley with the bridge destroyed in Ocarina of Time. 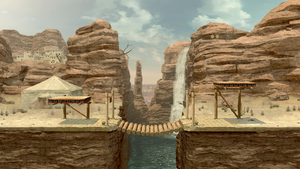 Gerudo Valley with the bridge destroyed in Ocarina of Time 3D. Gerudo Valley in Super Smash Bros. for Nintendo 3DS. The stage with the bridge destroyed, with Kotake and Koume flying in the air in SSB4. A clearer view of the lower part of the stage, with spikes visible in SSB4. Ice spikes emerging from the ground from Koume's ice attack. The left side of the stage set on fire by Kotake's attack in SSB4. Samus and Kirby look towards the carpenters' tent in SSB4. A close-up of Kotake and Koume in SSB4. Gerudo Valley on fire in Ultimate. Dark Samus using her forward aerial on Dark Pit on the stage. Isabelle using her Lloid special move on the stage. Ken alongside Koume on the stage. This page was last edited on April 16, 2019, at 08:11.